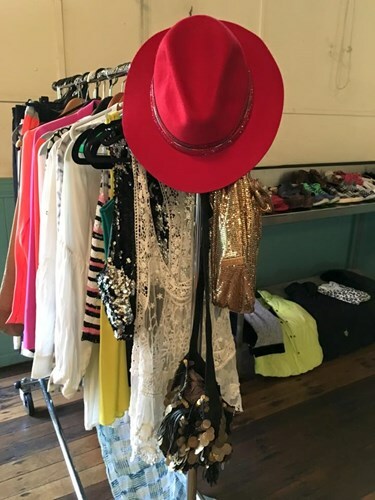 Join the Bangalow Fashion Market and convert your clothes, shoes and accessories to cash. We are excited to be back with our friends in Bangalow! 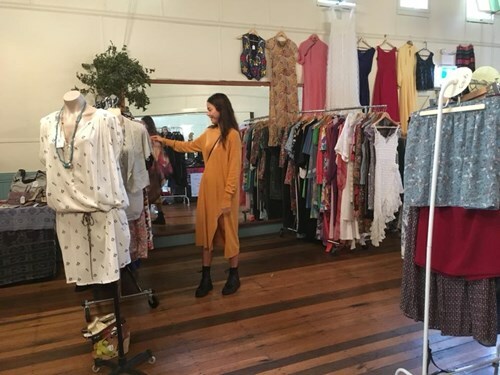 This is your chance to become a Seller at our BANGALOW event in June 2019! Book your Sellers Stall ASAP! Share the stall cost and come with a friend, pack up the car and set up shop with us. Turn your stuff into CASH in just one morning! Please join our facebook page and help get the word out to your friends, CLICK HERE. SHOP: You will be one of only a limited number of stalls on offer. This gives you a great opportunity to meet and sell to the local community of Fashionistas. We love this venue, but please be aware there are only STRICTLY LIMITED SELLERS STALLS available so please be quick to book. Shoppers do not need to pre-purchase a ticket, entry is $2 at the door. There is no ATM on site. There is an ATM a short walk from the venue, alternatively you might think about accepting bank transfer or paypal. It's also an ALL WEATHER venue, meaning you won't have to deal with the wind, the sun, and the chance of raining changing our date. SELL: As a Seller, you will be allocated a stall space. Set up your area with baskets, signs, mirrors, candles and anything else that creatively presents your clothes shoes and accessories to sell. You will be provided with a trestle table, included in your ticket price. 1) Stall on Verandah. This is a stall outside the venue and is exposed to elements in the case of wind/rain. You will need to bring plastic covers to protect your products in case of inclement weather. Includes 1 trestle table and enough room for 2 racks *1.8m long. 2) Inside Stall includes 1 trestle table and enough room for 2 racks *1.8m long. If you wish to remove your table you can fit 3 racks of clothes. You will either be positioned in the main hall or the podium level, allocated randomly. Position requests will be accommodated as best as possible. If you have a request for where you might like to be positioned in the hall, we will happily oblige where we can, but charges do apply for larger spaces and are payable in cash on the day. 3) Larger Stage Stall includes 1 trestle table and enough room for 3 racks *1.8m long. If you wish to remove your table you can fit 4 racks of clothes. You will need to bring a lamp with you as the stage lights are quite dark. You will be positioned on the stage area of the venue. Own a boutique, online store, indie label or vintage business? You're welcome to join in and come and sell on the day. Get some great exposure and build your following, by meeting a crowd of fashion-savvy shoppers. The mix of pre-loved, vintage + indie labels is what makes HER WARDROBE unique and we welcome all kinds of local fashion sellers! We will be promoting the event via the Fashionista Events subscriber database of over 40,000 clients, plus facebook, instagram, twitter and traditional media coverage. Please share on facebook and instagram! As a Seller you agree to promoting the event to your social networks leading up to the event. 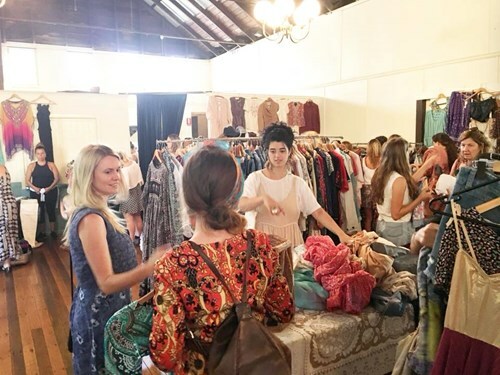 If you want to sell at Bangalow Fashion Market please purchase your Sellers Ticket ASAP. Our events always sell out! **REMEMBER, you are encouraged to split your stall cost with a friend to make it even more affordable. Strictly No more than 2 people per Sellers Ticket, as space does not allow. Hire of 1 Trestle Table is included in your ticket price. We will also have chairs available for you, although you will make more sales if you're standing up! Racks will be available to hire the week of the event. We will email you details about booking these. They are professional racks and will not fall over. They are $20 each and will be in your stall space when you arrive. Advertising and promotion for the event to drive shoppers to come and buy your items! The timing of this event is perfect! It gives you all the time you need to make the sales, and you still have time to enjoy the evening. Sellers Tickets are non-refundable. If event is to be cancelled for any reason, another day will be chosen for the event and tickets will be transferred to that new date. Please bring racks and anything else to display your items. If you have EFTPOS that’s great, please bring it! There is no ATM on site. Bags for your customers to put their new clothes in.